The beauty in tattoos is that they tell a story through body art. For many, tattoos are a way of expressing oneself and the options are endless in that regard. For others though, it seemed like a good idea at the time but now the regret has set in. You want to reverse the process, but you’re afraid of the tattoo removal pain that this could involve. 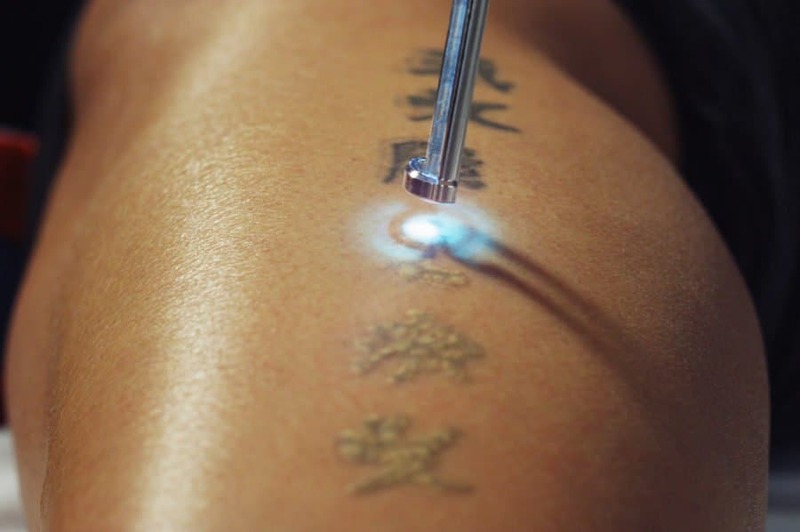 Let’s get into the details of laser tattoo removal, and what you can expect. Sometimes, we really don’t want a tattoo anymore, for any number of reasons. It may remind you of a time in your life that you'd rather forget. Lucky for us, there is a successful way to rid oneself of a tattoo. However, like the tattoo itself, and possibly the memory - this is not likely to be painless. Tattoos are permanent, and the process that makes them so is quite interesting. As the ink is inserted deep into the skin by the needles, the immune system thinks of it as an intruder. Similar to any other injury to the skin, white blood cells will spring into action to protect the body. The white blood cells will attempt to break down the ink, though very slowly. They will also carry small parts of it to the liver, where the ink will be processed and discharged. The ink particles, however, are too large for the small cells to handle, therefore they can't remove it in its entirety. This is what makes tattoos permanent. I’m afraid rubbing alcohol, baby oil or tape isn’t going to help you here. If you desire to remove a tattoo, you will need to do so with lasers. The laser will break up the ink particles bit by bit—making them smaller, and easier, for the white blood cells to remove them. 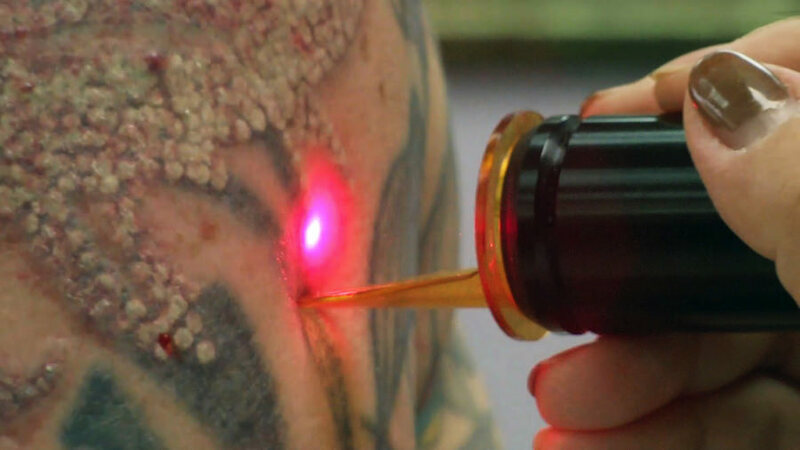 The lasers used for tattoo removal are “q-switched,” or ultrashort pulse lasers. These lasers are brought to a high temperature, which is needed to break up the ink. They work at an extremely fast speed, some as quickly as one trillionth of a second. This measurement is called “picoseconds.” The speed of the laser plays a significant role in how effective the removal process will be. The instant zap of the laser has to be quick enough to heat part of the ink particle while leaving the other part cool. The ink particles will be forced apart thanks to the varying temperature changes. Known as photothermolysis, this process is also used in other laser treatments, such as hair removal. Once the ink particles are shattered, whatever is left will be transported to the liver with the help of the white blood cells. Laser removal might sound like a quick fix to a permanent problem, but it isn't. The procedure can often take several rounds. Furthermore, some people won't achieve the results they were hoping for, because the laser couldn’t fully break up the ink particles. Holding off on the next session until the area is completely healed is crucial. Many clinics recommend waiting seven weeks between each session. 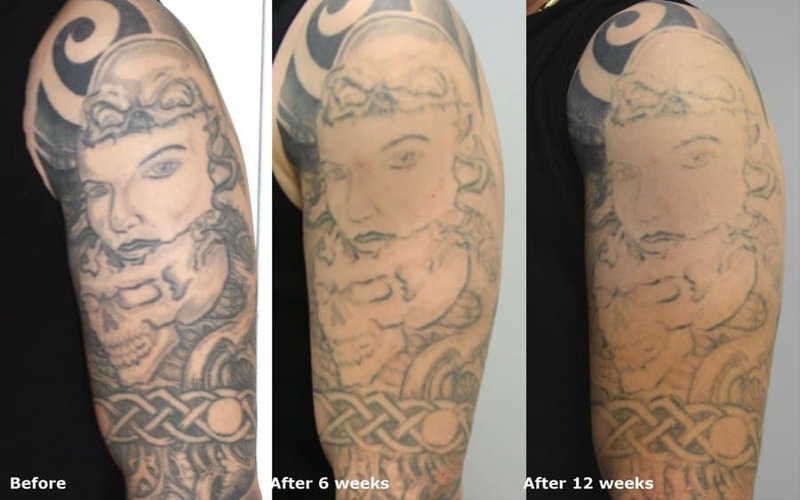 Undergoing laser removal more often than recommended won’t necessarily remove the tattoo quicker. Are All Tattoos Equal When It Comes to Removal? Definitely not—some tattoos are much easier to remove than others. It all comes down to a few factors, including the colors of the tattoo, the technique, and even the artist. Some inks are more difficult to break apart, making it hard to remove. Darker colors are the easiest—these can usually be fully removed after a few treatments. Lighter shades of green and yellow tend to be more persistent. Brightly-colored inks are also more difficult to get rid of. These particular shades can often only be faded to a certain point, but many times they don’t completely disappear. Tattoos done by amateur artists tend to be easier to remove. That is because the ink they use is usually less dense, making it easier for the laser to break the particles. Older tattoos are also much quicker to remove, because the white blood cells have been breaking the tattoo down for some time. Laser tattoo removal can be quite painful. Remember, the laser heats the ink particles—which are metals—to very high temperatures. The laser is then directed towards one particular spot. Because of the rapid speed, however, the skin tissue is not harmed. The energy from the laser forms a shockwave which sends vibrations through the skin. The vibrations will cause the skin to raise and become pale in color. This effect is normal and will only last a few seconds. Where the tattoo is located also plays a major role in how painful the removal will be. Underneath our skin, there are receptor cells. These cells pick up signals through the skin and send them to the brain. Some areas, such as hands and feet, have more receptor cells than others, making these places more sensitive. Choosing to get a tattoo in one of these sensitive areas, you can be sure it will hurt. The same goes for the removal of the said tattoo. If your tattoo is close to a bone or in a location where there's less fat, it will be more sensitive as well. 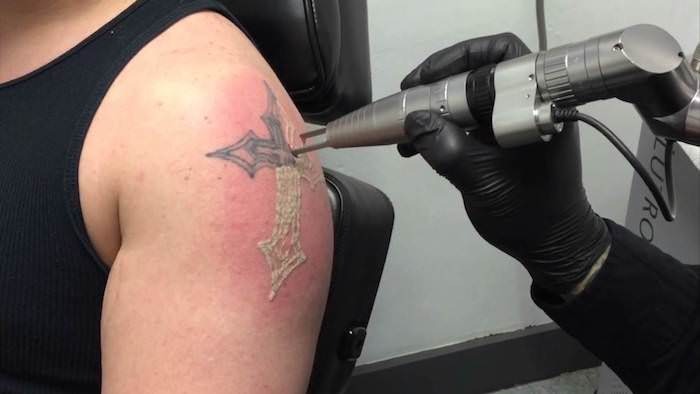 The feeling you experience with laser tattoo removal is different from person to person. Some people compare it to getting the tattoo in the first place. Others find it even more painful. This is an ongoing popular debate. It has been compared to having a rubber band snapped against your skin at one location several times. Others say it’s like a bad sunburn that is being scratched repeatedly. Sounds uncomfortable? How about getting repeatedly stabbed with a needle at high speeds? The good thing is that the pain usually never outlasts the treatment, so you won't have to go home in pain and totally uncomfortable. It does sometimes cause minor bleeding in the treated area. You might also notice quite a lot of redness, swelling or maybe even blisters. All the side effects usually go away on their own within 24 hours after the treatment. If you experience any severe symptoms, you should get it checked by a professional. In the weeks following treatment, you will most likely notice peeling or flaking of the skin. Scabs are also very normal—these are all part of the healing process and shouldn't be cause for concern. While the skin is healing, it is crucial to take care of it as advised by the physician. There should be no sun exposure or pool activities. The skin is considered to be sensitive and porous and the pool is a breeding ground for bacteria—especially a public pool. You do not want bacteria to reach your treated area, as this could lead to infection. The skin will generally take a month to heal after a session. Once healed, you can go on with another session to further remove your unwanted tattoo. Most clinics use some type of numbing cream to ease the discomfort. The cream is applied at least half an hour before the session. Although it will numb the skin a little, it won't make the sensation disappear completely. The creams usually contain different concentrations of prilocaine, benzocaine, lidocaine, or tetracaine. These ingredients are all effective in numbing the skin. Some creams are available over-the-counter, others are prescription only. Clinics which use numbing creams may ask the patient to apply it at home before attending the appointment. This is due to the time it takes for the cream to work. You can find cold air machines in nearly all high-end laser clinics. These are among the most effective ways to lessen the pain of the laser. The machine blows cool air on the area being treated. This device can be used before, during and after the treatment. If something burns, it only makes sense to treat it with something cold. Ice packs or cold compressions are excellent before and after treatment of the removed tattoo. The cold will soothe and numb the skin enough to make it a little less uncomfortable. Lidocaine injections are a local anesthetic typically used by plastic surgeons. The injection works instantly, but you might need more than one, depending on the size of the tattoo. Not all clinics will offer injections, as it can only be given by a medical professional. There is no way to avoid it—tattoo removal can, indeed, be painful. 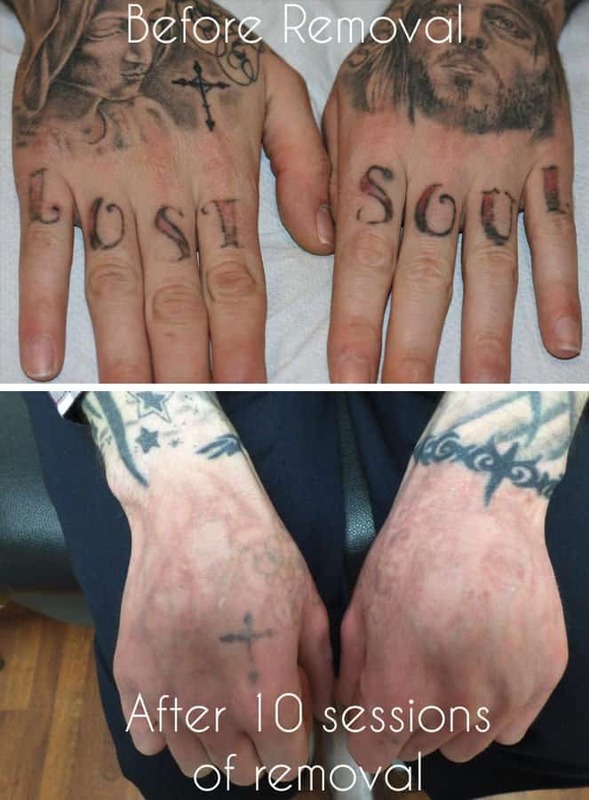 The laser treatment is often compared to the pain of receiving the original tattoo—whereas some say it's worse. Laser treatment will usually remove unwanted tattoos completely, although it will take several treatments and you will, unfortunately, experience some tattoo removal pain. However, a number of pain relief treatments may help ease the discomfort.